For the 8th time the Encuentro Milonguero ronda del querer will take place in Kassel. For the first time I will have the pleasure to join the DJ team. The event is organised by Susanne & Amir Helalat (TANGO Querido Kassel). Listen to the vals ‘Ronda del querer’ by Francisco Canaro with singer Carlos Galan (21/09/1934). 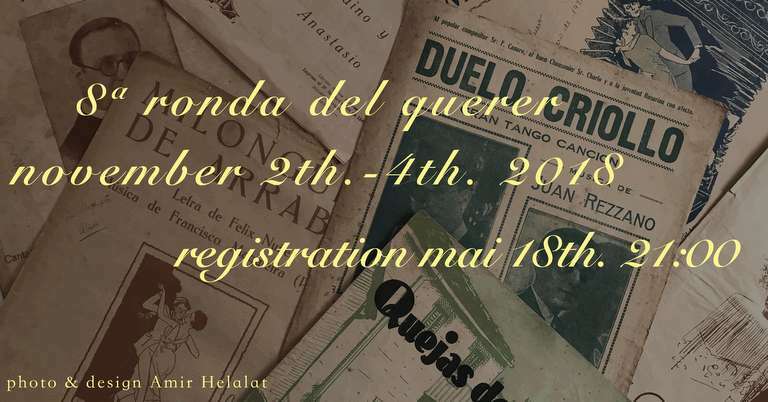 ronda del querer is a tango milonguero event exclusively for the Milongueras and Milongueros who love the music of the Golden Age and appreciate and respect the Códigos of the milongas as in Buenos Aires , observe and follow. For the musical enjoyment, selected Djs and Djanes, who will perform from Friday to Sunday. The idea is to participate in all milongas. This creates a common dance experience. We ” TANGO Querido ” love and appreciate the music of the Golden Age ( 30s – 40s ) and dance in close embrace ( Apilado ) . We want our event is characterized by a pleasant and hassle free stay. Therefore, we accept at our ” ronda del querer ” only Milongueras and Milongueros, who respect, follow and observe these Códigos. We hope you’ll understand and agree. The registration opens on Friday 18th May 2018 at 9 pm UTC +2.